As an adventure, I prepared a quick hair (just a minute) and different with a little tutorial for you. This hairstyle requires a small device, but it is easy to get to the steps that I photographed at the end of this post so that you can get the same result. You can click on the photos for a larger vision. The first step is to collect all the hair with a small elastic. Place the gadget in the center of hair behind elastic as shown in photo. Pull down gently gadget bringing back the hair elastic. The end .... put a hair clip or a small cloth to cover the elastic. The appearance of the hair varies simply making the top bun higher or lower. To make a gadget "home", a piece of wire needed to manipulate it malleable, (40 centimeters). Join the two ends, leaving one higher than another and cover tightly with adhesive tape, starting as seen in the photo and going after the tape (roll) halfway. You get something like this. This is an easy way out perfectly groomed in a very short time. No doubt you can make changes in this style with everything your imagination invents, please ... share. Although I finished yesterday evening dress for Sew Weekly this week, (the theme this week was something blue floral) I could not wear it until this afternoon, well, wear it in a manner of speaking only on the day of today is so dark and gray, threatening rain I could not take decent photos. The pattern of the dress is inspired by this image of a pattern that I saw on the net, probably from the time of the second half of the 60s. I was excited when I found this picture and remembered a fabric that was saved in my stash from a few years ago, I believe the union of the fabric to the model, is entirely symbiotic, but in the process ... The mind will work independently and clothing suffered any changes, just added white strips of fabric at the hem of the sleeves too. The shoes carried the girl in the blue dress has a slight resemblance to the ones I had stored in my closet, so that for some reason this outfit was hinting me. Anyway I had problems with the amount of fabric .... (of course). The raglan sleeves and also spend a fair amount folds were folded in her lap, I managed to get by a seam, so I could put the pieces of irregularly shaped pattern, which is not very important because the design of the fabric as permits. Playing with the possibilities of a garment is one of my favorite diversions, so when I finish sewing a dress ... then my mind starts to make an imaginary journey to every corner of my wardrobe and locate the various parts or accessories that can serve to set. It's funny because before starting to write this blog, I used to do this before and ended up sewing a garment hung on a hanger until I got the opportunity to use it, when this happened ... I left in a hurry and then I regretted not having put that scarf or these shoes because normally I remembered this when I was away from home ... but now this game is a mental exercise location very grateful. Am I the only?? Flower earrings that I made long ago are an original touch and an appropriate floral theme, do not you think the same?? 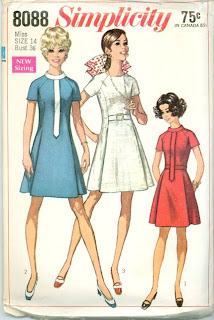 This time I went into "The Sew Weekly Sewing Circle". I knew this page thanks to the lovely Alina, she gave me information and helped me a lot. This site has a weekly theme for sewing, the theme this week is blue floral, so I looked in my stash a fabric according to the subject. The chosen model is very summery, so I may enjoy it within a few months, the fabric is linen with some polyester, so it has the right mix to be fresh and not too wrinkled. Although the model chosen (I haven´t the pattern, I drew it ) has two pleats in the skirt I had some problems that the existing fabric was 1.25 meters, so I had to adjust quite a bit and eliminate deep in the folds to make the raglan sleeves, but it turned out. For parts of the neck and front band will pull out a clipping piece of cotton pique who served in a dress once long ago. I thought that it would be nice detail in the cuffs and now I really like the effect achieved. Now I must hurry .... has yet to dress the movie this month. It all started when I decided I was a little tired of winter clothes and decided I wanted some color in my closet. Accessories are important, you know .... white shoes, white handbag, white lace gloves, blue earrings are amazing twins of these and have been waiting patiently in a drawer to show up the right clothes to show off. To close the capelet, I just did two small buttonholes and the closing went through them I did here with two thimbles buttons and a piece of string them together. 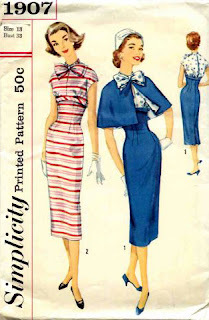 I love the dress, I admire its cheerful color and the arch of the neck but it didn´t go as wide as the image of the pattern (I do not have this pattern, only the image), because of the lack of material, but I still I think it was very good. At the end I fold back the comfort of the dress but not required, it is just a decorative element, but eliminated the band of blue that is the pattern image in the lower chest. So I turn the dress into something more wintry, coordinating it with a coat the same color in my wardrobe takes about three years. You know Lady, have fun sewing. I was in need of color!